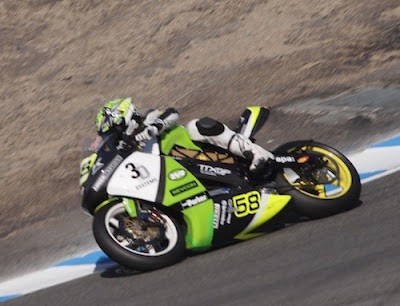 Electric Race News: In TTXGP, the eSuperStock is an interesting experiment, but the golden ticket? No. In TTXGP, the eSuperStock is an interesting experiment, but the golden ticket? No. Over on the TTXGP Matters blog is an interesting read suggesting that the eSuperStock Award in the 2012 North America TTXGP has brought us great racing, and that it's a great success. I suppose it all depends on how you look at it, but I find myself being disappointed with the eSuperStock bikes and think the TTXGP field must move away from having huge speed disparities. What makes the current crop of eSuperStock bikes disappointing is that they're running on the same field with top end bikes from Brammo, MotoCzysz and Lightning. Those three literally run rings around the other bikes, and while it was acceptable in 2010 and even 2011, we need to move beyond this. This condition exists in the North America TTXGP, because I believe the Europe and Australian series don't have such wide performance gaps. In the NA series we've always had a small set of competitors, mostly Lightning, who are pushing the envelope towards proper superbike speeds. In 2012 it is Brammo, MotoCzysz and Lightning who are doing this, and unfortunately there have been reliability issues getting in the way of each of these teams in competition with each other. The lap times each team has turned in this year have been closer to the 600cc superbikes than than in previous years. Where in 2010 the top laptimes were 15 seconds off the superbikes, now they're just a couple seconds off. In part we want to get the attention and participation of regular motorcycle racing. To do that two benchmarks must be met: a) speed, b) race distance. The top end bikes are closing in on the speed benchmark, but on 20+ mile races where in gas motorcycle racing they go for nearly 60 miles per race. Putting the Zero S's with their 88 miles/hr top speed against the Brammo, MotoCzysz and Lightning bikes simply makes the Zero S's look slower than they actually are, and sends the wrong signal. The Zero S's have a top speed of 88 miles/hr, and I suppose with the aerodynamic gymnastics the eSuperStock riders have been pulling they'll be going a bit faster than that. That's a decent top speed, and a relatively-speaking slow bike doesn't have to make for a boring race. That is, one of the most interesting races I ever watched was a 125cc Honda spec class race at (I believe) Mosport Canada during the 2010 season. The bikes weren't exactly fast, but because it was a grid of 30ish nearly identical bikes, the racers stayed together pretty well as a pack, and were dicing it up with each other the whole race, and rider skill was a major factor in the race. A full grid of Zero S's even with an 88 miles/hr top speed, I'm sure, would make for an interesting race. The Brammo, MotoCzysz and Lightning bikes on the other hand are going half again as fast. At the PRI race, Steve Atlas lapped the whole field, and had lapped a couple riders twice. During the 2010 and 2011 seasons Michael Barnes had done the same riding the Lightning bike. The point is that the field is so completely imbalanced that the top bikes on the grid are passing the slowest bikes as if they're standing still, despite the fact that the Zero S bike being passed is going flat out at a respectable 88 miles/hr. In 2010 it felt like we were having a miracle happening just having the bikes on the track. All the bikes that year were some kind of experimental machine, and I'd say this applied even to the Mavizen-supplied bikes. It was okay to have the huge performance disparities, because it was amazing enough that the race simply existed. In 2012 the quality level has raised pretty darn high. The Zero S's are manufactured quality bikes, offering much the same performance the Mavizen and other dual-Agni bikes of 2010 offered, meaning that in two years we've moved from experimental bikes to manufactured bikes. Even the one-off bikes from Brammo, MotoCzysz and Lightning are light years better than the bikes they had in 2010. Where I'm concerned is the picture being shown when you have ultra-fast bikes racing against fast bikes, and the ultra-fast bikes are passing the fast bikes as if they're standing still. It's amazing to see the ultra-fast bike do that, but it makes the fast bike look slow. The problem is in getting a large enough grid so that the TTXGP crew can simply put on the race. What the TTXGP staff tell me is that race weekend organizers (tracks, the AMA, etc) require the TTXGP to promise N bikes WILL be in the race grid. This is why we have fast bikes racing slow bikes in the TTXGP. Ideally the fast bikes would be in their race, the slow bikes in their race, and everything would be hunky dory. This is how it happens in gas bike racing. You don't ride a Honda 125 in a 600cc AMA Superbike race. You might use the Honda 125 as a pit bike to carry stuff for the 600cc bike to race with, but you don't race the 125cc bike in the 600cc race. You race 125cc bikes in 125cc races. The problem with eSuperStock is that it doesn't do a good job of defining a "race class." And, by the way, the eSuperStock is not a "class" anyway, it's an award. If it were a "class" it would be listed in the TTXGP rules, and it is not listed there. The TTXGP organizers have been careful to call it an award all season, except for a couple regrettable slips of the tongue at the Infineon race. The eSuperStock concept is defined as a production bike of over 25 units. Great. This year there is only one such bike which qualifies, the Zero S and Zero DS (which are essentially the same, but for suspension differences). Next year, however, there will be Empulse R's and Empulse TTX's both available presumably in production volume over 25 units. Additionally CRP may be back with a volume production version of the eCRP. And if Richard Hatfield is to be believed, he has the capability to manufacture duplicates of the Lightning bike, and if there were enough teams willing to pony up $35,000 apiece he could conceivably produce 25 of those bikes. That would mean a huge range of performance disparity all qualifying for eSuperStock. The purpose of the eSuperStock is to experiment with a long term goal of developing spec classes that will lower the cost of entry for teams hoping to race electric. However, such spec classes should be defined on some kind of performance benchmark rather than defining it by production volume. Again, this is how it's done in gas bike racing, where you have the 125cc and 250cc and 600cc classes. A complication however is the adjustability of electric bikes because the controller can be tuned to a variety of performance levels with the click of a mouse button. A team could qualify their bike for a given spec class with a detuned controller, then turn the controller up to 11 for the race, right? I've rambled enough on this that surely it will cause a few people to have points of view to share. Discuss below. The one thing I would say in response to your article is that you said in the beginning that the Australian championship doesn't have such huge performance discrepancy. But to be fair, they only have 2 bikes this year, and only 3 last year. If you only had the top 3 in the US then it would be the same. But then you would also have the problem of only 3 bikes zipping by, and then nothing for a long time until they came around again on the next lap. I agree on your point that it makes the zero bikes look slower, but at the same time, at least there is a larger grid than in Australia.